In February, the city of Beverly Hills will welcome guests with Chinese New Year celebrations that embrace Chinese culture and cater to its luxury-driven guests. We’re pleased to offer an overview of what the city has in store for the Year of the Dog, including a variety show at The Saban Theater on 2/11/18 and a host of hotel packages and amenities including “Tray of Togetherness” and “China Ready” teas, dim sum inspired desserts, Mandarin monogrammed pillows, Mandarin-speaking personal shoppers, Lai See (red envelope) welcome gifts, and more. SPECIAL EVENT: Join the city of Beverly Hills at the Seventh Annual Chinese New Year Celebration variety show happening at 2p.m. on Sunday, February 11th at the Saban Theater. The Beverly Hills Conference & Visitors Bureau has partnered with the China International Culture Association (CICA) and the Beijing Association for Cultural Exchange (BACE) to celebrate the Year of the Dog with a special public performance featuring the “Charming Jing Jin Ji” variety show with live acrobatics, musical performances and more! Tickets will be available on January 5 and are $8 each plus handling fees. Please visit lovebeverlyhills.com/dog for more information. The Beverly Hilton is offering comforting amenities such as Chinese breakfast available either in its restaurant, Circa 55, or through In-Room Dining as well as a pair of the hotel’s custom slippers, a Chinese newspaper, tea and a traditional “Tray of Togetherness” filled with sugared fruits and sweets for a new year. Guests can celebrate in the heart of the city at Luxe Rodeo Drive Hotel with two tickets for a Starline Celebrity Home Tour in addition to its “China Ready” welcome tea amenity and lush hotel slippers for ultimate relaxation after an adventure-packed day in the city. The Mosaic Hotel Beverly Hills, a luxury boutique hotel in the city, offers an overnight package that includes a special fortune cookie amenity each night, in addition to complimentary breakfast and Chinese staples like in-room tea and slippers. Montage Beverly Hills entices its visitors with a Mandarin monogrammed pillow, a dim sum inspired dessert, a breakfast voucher valid for In-Room Dining or at one of its two restaurants, Georgie or The Rooftop Grill, that offer stunning views of the city as well as a traditional in-room Chinese tea set up. At The Peninsula Beverly Hills, guests can enjoy a private consultation during the hotel’s afternoon tea service with a personal shopper, followed by a customized shopping experience guided by a Mandarin-speaking personal interpreter that will take guests to the city’s most sought-after boutiques. The stunning Viceroy L’Ermitage Beverly Hills will whisk visitors to shops, restaurants and more with its chauffeured services included in its overnight package that also entails custom amenities and a curated shopping experience. The Waldorf Astoria Beverly Hills unveiled its Lunar New Year package this year that includes a traditional Lai See (red envelope) with a surprise welcome gift from the hotel, a citrus fruit amenity that symbolizes wealth and luck in Chinese tradition as well as a Chinese tea turndown amenity for the first evening. Please visit lovebeverlyhills.com/dog for additional information and reservations. Credit: City of Beverly Hills. 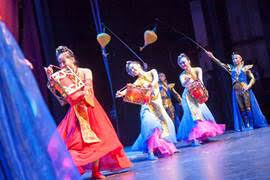 Photo: Chinese New Year Variety Show at the Saban Theater.